Phelan’s bravery in making public her missed CervicalCheck results led to national outcry and an investigation. 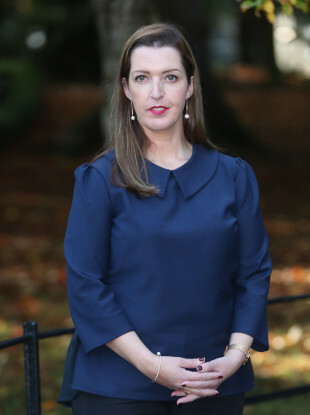 Vicky Phelan said the education she has received allowed her question and challenge doctors and expose the CervicalCheck scandal. VICKY PHELAN HAS been awarded an honorary fellowship from Waterford Institute of Technology (WIT). As a result of her taking the company involved and CervicalCheck to court, we now know more than 221 women have been affected by the scandal. At this stage 20 women, including Emma Mhic Mhathúna, affected by the misread results have died from the disease. However Dr Gabriel Scally whose report into the controversy was released in September has warned many more women may be affected. In recent weeks Phelan and fellow survivor Lorraine Walsh and Stephen Teap whose wife Irene died from the disease established the 221+ support group in order to help the women and their families affected by CervicalCheck scandal. Today President of WIT Willie Donnelly praised Phelan for determination throughout the controversy. In a moving tribute Donnelly said “Irish society was all the better for Vicky Phelan’s unique and generous contribution”. Vicky demanded truth and fought for equality for all. Phelan is the Head of Literacy Development at WIT and the honorary fellowship is the highest award the college can bestow. She was joined by her parents Gabbi and John, husband Jim and children Amelia and Darragh at the ceremony. Addressing those gathered today Phelan described herself as a lifelong learner. Quoting Nelson Mandela Phelan said she has used her education to expose the CervicalCheck debacle. She highlighted the lack of critical thinking taught at secondary schools, saying students learn to “read, memorise and regurgitate”. “Critical thinking helped me to expose what happened”, skills she said she only learned because she was privileged enough to continue her education through third level. Critical thinking allowed me challenge what I was told, after reflecting on how I went from an all clear smear to invasive cervical cancer. I believe what happened to me, happened for a reason. I believe I have finally found my role in life. Phelan said her tumours have now reduced by 50%, due to a drug she found through her own research, after her medical team told her she had only a matter or months to live. I am honoured to accept this award and wish to accept this award on behalf of the women of Ireland for whom I have been campaigning and who inspire me to continue in my campaign for improvements in women’s healthcare. You can watch Phelan’s speech in full here. Email “'My education allowed me challenge the medical profession': Vicky Phelan receives honorary fellowship at WIT”. Feedback on “'My education allowed me challenge the medical profession': Vicky Phelan receives honorary fellowship at WIT”.